The full extent of how hackers managed to hijack the petition demanding a second EU referendum can be revealed by MailOnline. 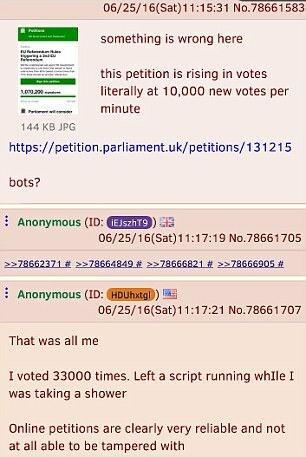 Hackers then boasted about their exploits in online forums and openly mocked how easy it was to infiltrate the UK Parliament petition website. 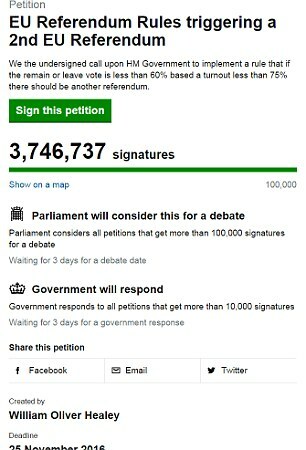 The petition has attracted more than 3.7million signatures and has led high profile figures to use the petition as proof of the public appetite for a re-run of last week’s referendum, which was won by the Brexit campaign by more than 1.2million votes. 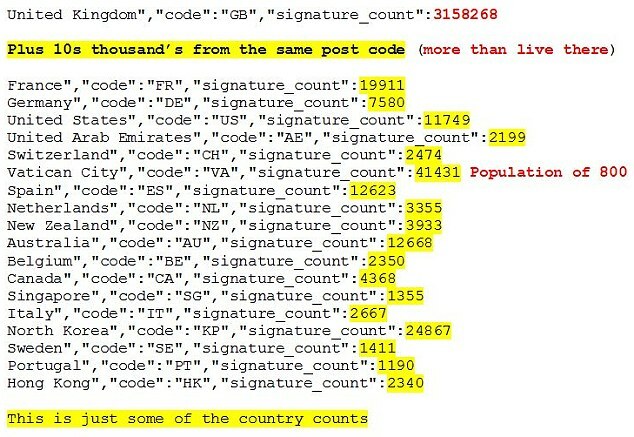 Computer bots were able to use scripts that automatically signed up hundreds of thousands of fake signatures by using the same UK postcode – many of which were the Palace of Westminster’s SW1A 0AA address. They deliberately directed their names to appear as residents of a host of different countries, including tiny states such as Vatican City to ‘show your democracies are a joke’. It meant more than 42,000 signatures were registered in the Vatican City, despite the tiny papal state having a population of just 840. There were more signatures registered from the least populous country of Pitcairn Island than the 56 residents living there. There were even 24,867 signatures registered in North Korea, where the internet is highly censored and accessed by a tiny minority of the population. Thousands were signed up from other tiny states, including Palau, the British Virgin Islands, Liechtenstein, British Virgin Islands, Liechenstein and St Kitts and Nevis – as well as the disputed Occupied Palestinian Territories. 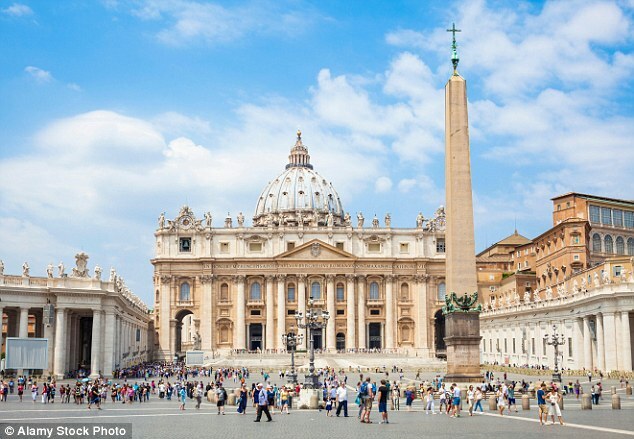 Writing in a mix of Arabic and English, a hacker claiming to be in Syria said ‘God willing’ the number of signatures from the Vatican City would ‘soon exceed actual Vatican population and from then on it’s pure bants’. Another anonymous hacker boasted how he had signed up 33,000 times while he left a script running as he took a shower. UK authorities have started investigating the fraudulent sign ups but have only managed to remove a fraction of the total number of fake signatures, according to data experts. MailOnline has obtained details and photos of online forums used by hackers to boast about how many fake signatures they managed to register. On a forum titled ‘Politically Incorrect’ they openly bragged about their exploits. One hacker wrote: ‘Syrian blackhat here. (This means “hacker” for the illiterates among you). 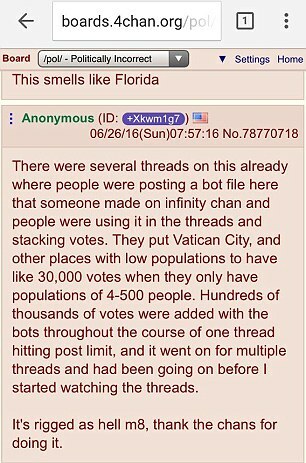 Another anonymous hacker writing on the 4.chan.org website boasted: ‘I voted 33,000 times. Left a script running while I was taking a shower. The House of Commons denied the petitions website had been hacked. It said more than 77,000 signatures had been removed so far by the Government Digital Service, which monitors for suspicious activity. 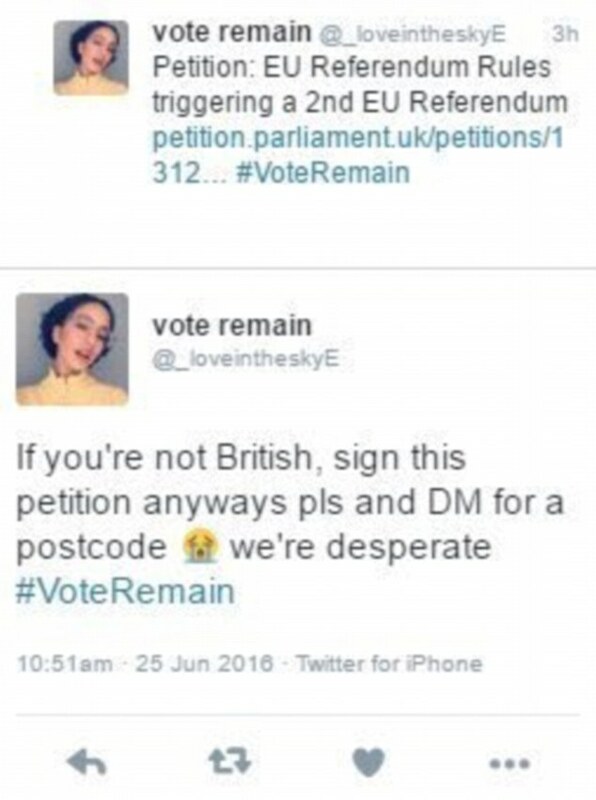 Legitimate pro-Remain sign-ups to the petition in the UK have also appealed on social media for people around the world to help in their bid for demanding a second referendum by signing up, despite only UK residents allowed to register. Hackers boasted on blogs about how many fake signatures they managed to sign the petition and mocked the UK Parliament’s petition website for allowing it to be so easily hacked. Sign-ups must tick a box stating they are a British or UK citizen and give their name, email address and postcode. Screen shots of automated scripts run by hackers reveal how they are able to sign up thousands of times at once. The petition demands a re-count of last Thursday’s referendum because turnout was less than 75 per cent and the margin of victory was smaller than 20 per cent. Ironically, the petition was set up by a Brexit supporter. 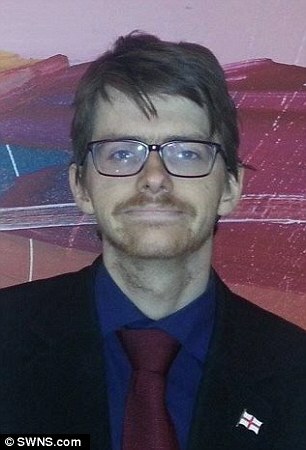 William Oliver Healey, a final year student at De Montfort University, set up the petition in case the Leave campaign lost by s slim margin but ironically it was hijacked by Remain supporters after Thursday’s 4 per cent win for Brexit. The Government’s digital service has made clear that signing up to the petition from overseas or signing it more than once was not a criminal offence but it undermines the credibility of the demands. Yesterday Tony Blair said a second referendum on EU membership should not be ruled out. The former Labour prime minister admitted the prospect seems unlikely but suggested MPs could consider the option once a new deal had been struck with the EU within the next couple of years. Business minister Anna Soubry promoted the petition calling on the Government to stage a second referendum despite a record 33.5million people taking part in Thursday’s referendum, which delivered a 4 per cent margin in favour of cutting ties with Brussels. Remarkably, Labour MP David Lammy went a step further yesterday as he said his colleagues should vote to overturn the ‘non-binding’ decision in Parliament for the sake of the economy. The protests against the EU referendum result came despite a record 33.5million people taking part in the referendum – the highest in any election since 1992 – in which Leave won with 51.9 per cent, a margin of 1,269,501 votes. A heat map of the UK-based signatures reveal that a majority of signatures are from people in London and areas with a high population of students, which predominantly voted Remain, meaning the result may not be any different. The result of the EU referendum should be overturned by a Commons vote next week, a Labour MP has insisted. Former minister David Lammy said the poll, which produced a narrow, surprise, win for the Leave side, was non-binding and parliament remains sovereign. The Tottenham MP said the Commons, where a majority of members backed Remain, should ‘stop the madness’ of Brexit. ‘Wake up. We do not have to do this. We can stop this madness and bring this nightmare to an end through a vote in parliament. ‘Our sovereign parliament needs to now vote on whether we should quit the EU. ‘The referendum was an advisory, non-binding referendum. The Leave campaign’s platform has already unravelled and some people wish they hadn’t voted to leave. ‘Parliament now needs to decide whether we should go forward with Brexit, and there should be a vote in Parliament next week. ‘Let us not destroy our economy on the basis of lies and the hubris of Boris Johnson,’ Mr Lammy said. Thousands came from north London, Cambridge and Oxford, while more than 3,000 of David Cameron’s constituents also signed the petition. Because it easily passed the 100,000 target, MPs will be forced to consider the proposal in Parliament this summer. The petition demands the Government re-stage the referendum because the winning vote for Leave was less than 60 per cent and was based on a turnout of less than 75 per cent. The result revealed stark divisions between young and old, north and south, cities and rural areas, and university-educated people and those with fewer qualifications. The House of Commons Petitions committee will now be forced to consider staging a debate in Parliament on the proposals for a second referendum. Their next meeting is tomorrow after MPs return from a mini-recess, although it might have to wait until the following week to be discussed. Responding to revelations the website had been hacked, a House of Commons spokesman said: ‘The petitions website has not been hacked, despite any claims that may have been made. 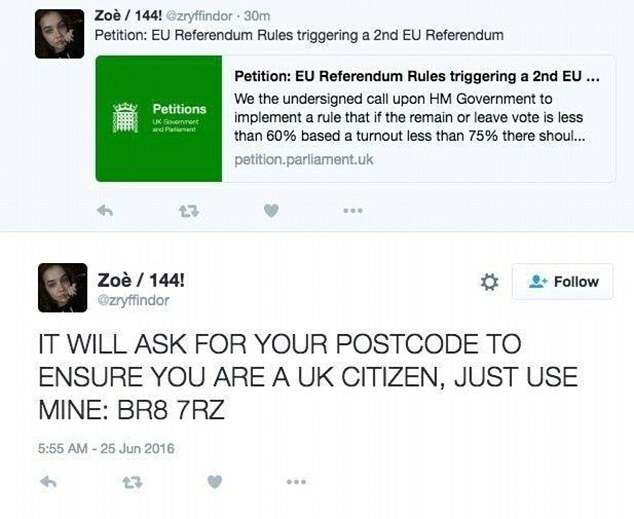 ‘Any UK resident or British citizen is entitled to sign e-petitions. We ask petitioners to confirm their details, including name, email address, and postcode. ‘The Government Digital Service investigates signature patterns to check for fraudulent activity on petitions. 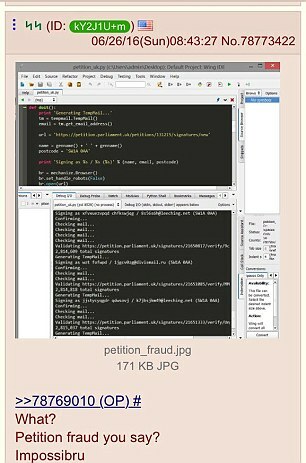 Any signatures which match more than one of the criteria indicating fraud are removed. ‘Just over 77,000 signatures have been removed which were added fraudulently and the Government Digital Service (GDS) continue to monitor for suspicious activity. ‘GDS use a number of techniques, including automated and manual, to identify, block or remove signatures that are clearly bots. However the spokesman said they were unable to comment on security checks. June 27, 2016 in EU Erosion.